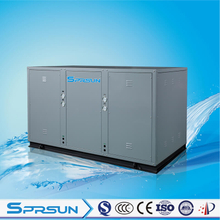 Ground source heat pump is an efficient, energy-saving and environment-friendly air conditioning system, which utilizes geothermal resources from shallow underground to provide hot water, room heating/cooling. Ground source heat pumps can transfer energy from low-temperature heat source to high-temperature heat source by inputting a small amount of high-grade energy (electricity). The temperature of ground energy or shallow surface geothermal resources is relatively stable throughout the year, higher than that of ambient air in winter and lower than that of ambient air in summer, so it is a good heat source of heat pumps. This temperature characteristic makes ground source heat pumps 40% more efficient and energy-saving than traditional air conditioning systems. 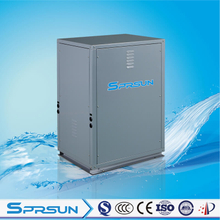 In addition, the constant temperature of ground energy makes the heat pump unit run more reliably and stably, and also ensures the efficiency and economy of the system. Compared with electric heating, the pollutant emission of ground source heat pumps is reduced by more than 70%. If combined with other energy saving measures, the energy saving and emission reduction of geothermal heat pumps will be more obvious. Ground source heat pump units can provide heating and cooling, as well as domestic hot water. One unit of this heat pump can be multi-functional and replace the original boiler plus air conditioner. 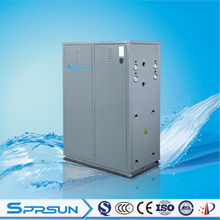 Geothermal source heat pumps can be used in hotels, shopping malls, office buildings, schools and so on, and they are suitable for the heating and air conditioning of villas.